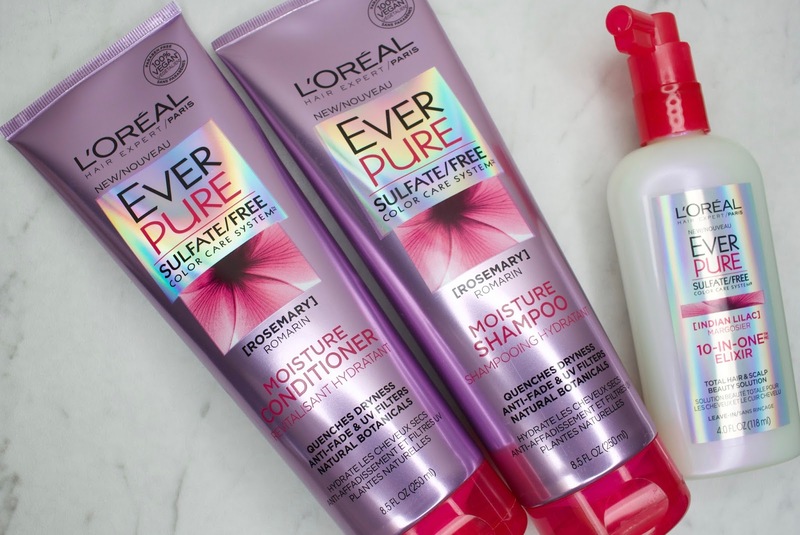 The Loreal EverPure line has to be one of the best drugstore lines I have ever tried. Asians are known for having straight and beautiful hair, or at least that's what people seem to believe. Although I was blessed with beautiful hair as a child, my hair still got damaged by the overuse of heating tools and hair dye. I can't remember the last time I didn't dye my hair or using heating tools to style my hair. After getting sick and tired of all the fallout, split ends, and breakage, I decided that I should start taking better care of my hair. I've been in the market for good shampoo and conditioner for my hair. I tried to stick with the more natural/organic hair products but nothing seemed to really work for me. One day I ran out of Herbal Essence shampoo and conditioner and I decided it was time to try something else. Low and behold, an Influenster box arrived at my house with these products. To be clear, this post is not a sponsored post, I just want to share my thoughts on these products with you guys. Anyway, when I received these, I was so happy and I told Justin "Babe, I don't need to buy new shampoo and conditioner this month, I just got a box of L'Oreal products to try!" To be honest, I don't think I've ever been a big fan of L'Oreal hair care products. Of all the products that I've tried from them, nothing seems to really work for me. At one point I decided not to waste any more money on the brand. I honestly did not expect to have a positive outcome from using these products.... at least not until I actually used them. I decided to use these products at the same time because I think these products were designed to work together in order to achieve the maximum results. First, let's talk a little bit about the products. The EverPure line includes many products for all types of hair such as volume, color care moisture, deep conditioning, frizz, etc. They all came with shampoo and conditioner, and some have treatment options as well. The products that I received are the Color Care System Rosemary Moisture. These products were designed for processed hair, which is what I have. Here is what these products are designed to do. "EverPure Moisture Shampoo with rosemary deeply replenishes dry hair with essential moisture, lush-touch softness and luminous shine. Keeps color pure for up to 4 weeks. Color-treated hair requires special care. Our shampoos for dry hair are especially gentle on color. There are no harsh sulfates, salts or surfactants that can strip, dull and damage hair. Experience a purely sensorial rich, creamy formula and a fresh aromatic fragrance that blooms. 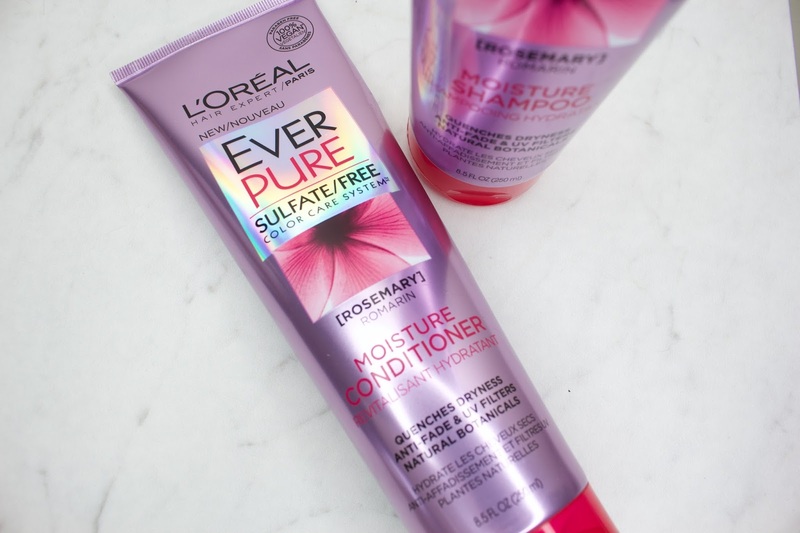 Pure respect for your hair.- L'Oreal Paris"
"EverPure Moisture Conditioner with rosemary gently cleanses dry hair to replenish essential moisture, lush-touch softness and luminous shine. Keeps color pure for up to 4 weeks. Color-treated hair requires special care. Our conditioner for dry hair are especially gentle on color. There are no harsh sulfates, salts or surfactants that can strip, dull and damage hair. Experience a purely sensorial lush, luxurious lather and a fresh aromatic fragrance that blooms. Pure respect for your hair.- L'Oreal Paris"
"EverPure 10-in-1 Elixir is a total hair and scalp beauty solution with Indian lilac transforms hair vitality in just one week. Skincare inspired super treatment delivers 10 benefits in 1. Hair stays healthy, reflecting color radiance and is an integral part of any sulfate-free hair care routine.-L'Oreal Paris"
Before I decided to try this out I did some research and read reviews and comments. I've seen mixed reviews regarding these products, though I have nothing bad to say about these products. After the first usage, I felt that my hair was instantly transformed and so nice, soft, and touchable. Normally when I use shampoo I have to follow immediately with a conditioner because my hair is so rough and stripped of natural oils. This shampoo did not do that to my hair at all. It made my hair so nice and soft and I didn't feel the need to follow up with a conditioner, although I did so out of habit. This conditioner just made my hair softer and added beautiful shine to it. I do like to finish my shower with cold water to help make my hair shinier and healthier. As for the elixir, I think this is probably the one product you can skip if you're low maintenance and don't like to spend extra time. I like to use this once a week. I really love how this product adds a nice scent to my hair. It promises to nourish, hydrate, soothe, repair, smooth, strengthen, soften, and add shine to your hair. I can't say that it actually did all of that, but it did add softness and soothe my hair. I noticed the results of this hair care system, but didn't expect others to notice it at all. I was pleasantly surprised when my hair stylist asked me what I did to my hair because it's so shiny and healthy. I thought, "Wow, these products really do wonders for my hair." I highly suggest you give these products a try. If you do try these products let me know how you like them! I would love to hear your pros and cons. I tried a sample of these a while ago and really liked them, did great things for my hair. I love sulfate free products! Ooh I love that it's sulfate free and vegan!